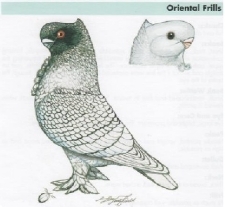 The most important characteristics of this breed are the head properties, but all other attributes should be taken into consideration for the perfect speciment of the Oriental Frill. Upright and smart. Eye to be over the ball of the foot. Large, round, high, broad and well arched, forming an unbroken curve from neck to tip of beak; well filled in between the eye and beak, showing no flatness on the crown. To be fine and neat in texture. Short, thick, wide at the gape, upper mandible curved downwards, forming continuation if curve of skull. Lower mandible stout, meeting and supporting the upper, both being of equal substance. The line between the mandibles must be straight, and so that the line were continued backwards it would run through the centre of the eye. Small, heart shaped and fine in texture. Smooth and showing no break when viewed in profile. Needle pointed, upright and central, raising above a well defined mane and as high as possible. Well developed and full under jowl. Thick, broad at base, well arched mane. Frill: As much as possible, well covered chest. Full wide chest, well rounded. Medium in size, compact, rather short than otherwise. Flights to be short and carried compactly over the tail. To be close fitting, short and carried above the ground. Close fitting and in great condition. Frill to be as much as possible, and to cover the chest. The Oriental Frill are split into two main colour varieties; Satinettes and Blondinettes. Other Varieties of Oriental Frills exist such as Visors, Dominoes and Turbiteens. SATINETTES are prodominently white in colour, with coloured wing shields and tail. 10x10 white flights, and not les than 5x5 flights. Beak, pale flesh; eye, very dark brown; head, neck and body under parts, white; shoulder, wing coverts, ground white, each feather edged all round with a fine purple edging. This edging may be laced, arrow pointed or ticked, preference to be given in the order named, and heavy, medium, or fine, but in either case, the edging must be distinct, even, regular and well defined; flights, white, 10x10, not less than 5. Tail, dark purple blue downward from a line across rump, having dark blue band at lower extremity, upon which should be on each and every feather a clear round white spot, "moon", or band clearly defined; shaft of feathers dark. Same as blue laced, only differing in shade of colour, the edging of each feather in shoulders being dark red brown, marked as in blue laced, ground colour white. Same as above except the ground colour on shoulders, wing coverts, and tail should be plae sulphur to white and every feather edged with sulphur of a darker shade.Tail, pale to dark sulphur, marked as in blue-lace Satinettes. Same as above except that shoulders and wing coverts should be clear solid blue with two clear-cut white bars, edged at lower extremity with black. Tail blue, marked as in blue laced Satinette. Same as bluettes except that should and wing coverts should be pale solid silver grey, edged at lower extremity with darker shade. Two clear cut white bars edfed in brown at lower extremity. Tail grey, marked as in blue laced Satinettes. Same as above except that the shoulders and wing coverts should be dove coloured, with two clear white bars edged at the lower the lower extremity with brown. Tail brown, marked as in Blue Laced Satinettes. Same as Blue laced except that every feather on shoulders, wing coverts and tail should be edged with black or dun. The shafts of laced flights and tail feathers to be dark coloured. BLONDINETTES: These are completely coloured ( except the Black and Dun laced) with the exception of the shoulders and wing coverts, upon which every feather should be edged ( either laced, arrow pointed or ticked, preference to be given in the order named), on a white ground colour and the tail also marked as in Satinette. The primary flights should be marked with an oblong white spot at the extremity of each feather. Beak black; eye red; cere damson if possible, body and tail colour a clear bright blue on a white ground. Spot tail. Beak, horn colour; eye, yellow gravel cere, flesh colour, otherwise similar to blue laced except that the body and tail colour should be silver grey and lacing a deeper shade of same colour. Neck hackle must not show any yellow, sulphur or any alien colour. Spot tail. Beak horn colour; eye yellow gravel; cere flesh colour; body and tail colour French grey with dark sulphur lacing light ground, proportionately suffused with pale sulphur according to width of lacing, the neck and head suffused as much as possible with a bright golden sulphur. Spot tail. Beak horn colour; eye red; cere flesh colour; body and tail coloour and lacing acorn brown. Spot or laced tail, former preffered. Beak horn colour; eye red; cere flesh colour. Body,tail colour and lacing a deep rich bright red. Spot or laced tail, former preffered. Beal black colour; eye red; body colour, solid bright blue with two clear cut white bars, edged at the lower extremity with black, tail and flights as in Blue laced. Beak horn colour; eye yellow gravel; body colour, silver grey with two clear cut white bars, edged at the lower extremity with black, tail and flights as in Blue laced. Beak horn colour; eye yred; body colour, dove grey with two clear cut white bars, edged at the lower extremity with brown, tail and flights as in Blue laced. 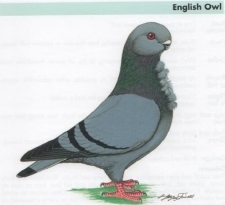 Beak, Black or horn according to colour of pigeon. Eye, in Blacks, red; in Duns, yellow gravel. Cere in Blacks, damson, in Duns, flesh colour. Head, solid or frosted. Ground colour, white, every feather distinctly laced all over the bird and as far as possible right around the whole edge, inlcuding frill, muffs and tail. Feather shafts, Black or Dun as the case may be. These should be exactly the same as in the normal Satinette in type, head points etc., and in markings except that the head should be solid coloured and clear cut to well-defined line running across the neck from the bottom of the gullet to the back of the crest. Except for having legs free from feathers, these should be exactly the same in type, head points, etc. as in normal Oriental Frill. They differ in markings as follows. Beak: Upper mandible to be black in Blacks and Black chequers, horn coloured in others; lower mandible to be white. Eye: Dark Brown, ruby or orange. Eye Cere: According to colour. Body Markings: White body, tail, primary flights, gullet, leg and foot feathers; coloured shoulders and wing covers. Flights 10x10, not less than 5x5. Head Markings: Three equal-seized spots that are on the frontal, commencing at the wattle and covering the forehead, well rounded at the top, the cheeks spots extending from the base of the lower mandibled and covering the checks under the eye, oval shape. A distinct white line running from beak to eye, dividing the frontal and cheek spots is preferred, but if spots regular in size, the white line is not essential. Colours: Black, Dun, Yellow, Red, Blue with black bars; Silvers with bars as dark as possible and the various chequers. All self colours of the deepest lustre. No frill present on exhibits. Mismarks appearing in the marked colour varieties e.g Satinettes, Dominoes and Visors. The bird having a long cast appearance. The beak being twisted. Peak appearing to be too far down the neck. The appearance of a bump above the eye. It is vital that the highest standard should be obtained in typical Oriental Frill. Quality depends mainly on a general combination of the chief characteristics, head properties being of prime importance, especially the beak and sweep, with good width and substance of the skull. Birds when exhibited should be in perfect natural condition. Beneficial preparation of an exhibit should be encouraged. Wattle and Gape 2 Points 13 total. GRAND TOTAL FOR LACED OR BARRED BIRDS: 100 POINTS TOTAL. YEAR OF PUBLICATION: Re-formatted to reach the EE Model on 2012. Originates from the North African coast; arrived into England in about the 19th century; first exhibited in 1858. Developed in England over many years. A well built Field pigeon type, with alert stance, upright and bold. Round, as large as possible, forming a bold and regular arch from front and side view; well filled in between the eye and beak. Large, bolting, not sunken, set in the centre of the side of the head. Colour of eye: White coloured birds to have bull or claret eyes; Blues, Red or Black coloured birds to have reddish gravel eye; all other colours to have a reddish or yellow gravel eye. Two different coloured eyes are acceptable in pied birds only. Fine and regular in texture, dark as possible in colour on Black and Blue coloured birds. All other coloured birds of a lighter shade: Whites, powdered white is the required colour. Close fitting and short, blunt at the tip. The upper and lower mandibles of equal substance, meeting and fitting in a straight line, which when continued backwards should extend through the centre of the eye; this is termed as ''beak setting''. Beak colours for blacks, blue and blue chequers, black; for silvers, duns, and silver and dun chequers, light horn colour. Reds, yellows and whites should be a flesh colour. Fine in texture, small in size and covered with a white powdery bloom; it should rise out of the curve of the head, but form part of this curve. When viewed from the front, the wattle should be heart-shaped. Wll developed, quite filling up the hollow of the throat and terminating in a frill. Neck: Short and thick, boldly tapering from the shoulder to the junction of the head, full under the jowl. Ample and well developed as possible. Small, compact and cobby. The ideal African Owl should be no longer that 8'' inches (203mm) from the breast to the tip of the tail. Flights to be short, finishing 1'' (25mm) from the end of the tail. The flights to be carried well up, and not dropping. Short, and carried off the ground. Short and free from feathers under the hook. Feet small and brilliant red in colour. The feathers should be hard and close fitting and in great condition. Frill to be ample. Black, Red, Yellow, Dun and White Self's, all too pure throughout. Blues, Silvers and Mealies exist, all with a well defined bar, even and distinct. These should have a Black bar in Blues, Dark as possible in Silvers, and Mealies to have a Red, Yellow or Dun bars and hackle. Chequres should be evenly marked, distinct and chequering on the shoulders. Gizzle, Lavenders and Mottles exist. Coloured birds with white feathers on any part of the body, head or flights are a non standard colour and are termed as stock or pied. Whites with a coloured tails are recognised as being a tail mark. Blues, with ticks, bronzy, or kite bars, complete in the Any Other Colour classes. Blacks and Whites, with opposite coloured rumps, are classed as Pied. The bird bein of the wrong size i.e too big. Lack of frill is a serious defect. Birds without a frill are not to be judged. Heads lacking in Substance and a having the wrong beak setting. A pinched face (forming a ''V'' when the face is viewed from the front) is undersirable along with a beak protruding from the desired circular shape of the head. It is vital importance that the highest standard should be obtained in a typical African Owl Quality depends mainly on a general combination of the chief characteristics head properties being of prime importance, especially the skull being round, as large as possible and wide on the frontal. Birds when exhibited should be in perfect natural condition. Benefical preparation of an exhibit should be encouraged. 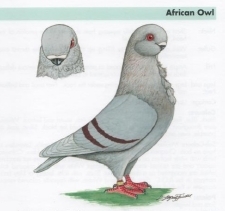 Origin: Oriental sources, perhaps related to the African Owl. Referred to in Willoughby’s Ornithology (1678) and Aldrovandi (1603) in Italy, and by Moore (1735). 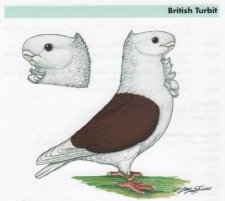 In the mid- 17th century, the Turbit enjoyed a reputation as a flying variety. Breed club formed in 1879. Overall Impression: Medium, compact and cobby in size. Very full in the breast, and upright carriage; short in flights and tail, the wings carried well up and not drooping. Head: Large and wide, but not long; forehead moderately high and round, with well bulged and full frontal. Wide in gape and full cheeks. Eyes: Bull, i.e Dark Hazel, large and bolting. Eye Ceres: Pale ceres, free from redness, fine in texture. Beak and Sweep: Short, thick and wide. Both mandibles as stout as possible, fitting closely together, the lower forming a strong support. If a line is carried through the beak line, it should end up below the eye. Peak and Mane: Peak springing from an unbroken mane and ending in a fine point above the head. The mane to be knife-like, commencing well down on the shoulders and continued upwards in a perfectly straight line (when viewed from the back) and to add, with gullet to the width of the neck. Wattles: Smooth in texture, fitting close and even and only enough, to leave no ridge or break in the outline. Gullet: As much as possible, quite filling up the hollow in the throat. Gullet to be the width of the neck. Neck: Full width of the chest, tapering to the head. Frill: As much as possible, long in feather and firm in texture, turning both ways and extending from the gullet, well down into the breast. Body: Medium size, being compact and cobby. Wings: Flights to be short, and carried well up, and not drooping. Tail: Short, and carried off the ground. Legs and feet: Short and free from feathers below the hock. Plumage: The feathers should be hard and close fitting and in great condition. Frill to be ample, extending from the gullet down into the breast. Stance/Carriage: Bold, upright and smart. Recognised Colours: Black, Dun (Kite), Red, Yellow in self shield marked. Blue, Silver, Mealy and Cream in the barred colours. The bars on the Blues to be Black and for the Silver as dark as possible.All the bars to be broad, even and distinct. Order of Importance: It is vital importance that the highest standard should be obtained in typical British Turbit. Quality depends mainly on a general combination of the chief characteristics, head properties being of prime importance, especially the beak and sweep, with good width and substance of the skull. Birds when exhibited should be in perfect natural condition.Benefical preparation of an exhibit should be encouraged. Beak & Sweep: 25 points. Year of publication: Re-formatted to meet EE-Standard model on 06/03/2012. Origin: England developed from imported stock. Recorded by Willoughby (1678) and Moore (1735).The English Owl Club was formed in 1892. Overall Impression: Embodying substance with quality. A larger version of the African Owl. Head: Large, massive (circular). Forming a bold regular arc from the front and side view, well filled in between the eyes and beak, and showing no flatness anywhere. As wide as possible, the width of the gape being the same as the width across the eyes. Eyes: Eye large, bold, set exactly in the centre of the side of the head. Red in colour for all colours varieties, except Whites, which should be bull or claret. Eye Ceres: To be circular in shape, fine and neat in texture. Damson colour for Blues, Blacks and Mealies. Flesh colour for all other colours. Beak: Short, thick, upper mandible well curved downwards, forming continuation of the curve of the head/skull. Lower mandible stout, meeting and fitting well under the upper. The top line of the under mandible must be straight and so set, that if the line was continued backwards it would run into the centre of the eye. Wattles: Fine in texture, small,neat and heart shaped. Gullet: Well developed, commencing at the tip of the lower mandible and terminating in a rosette or frill. Neck: Short, rather thick, boldly tapering from shoulder junction with head, full jowl. Wings: Flights to be short, and carried compactly, and well carried. Tail: To be close fitting and carried clear of the ground. Legs and feet: Legs are short, free from feathering below the hock; feet to be strong and toes well divided, brilliant red in colour. Plumage: The feathers should be hard and close fitting and in great condition.Rossette or Frill to be ample and well developed as possible, either admissible, rosette preferred. Recognised Colours: Blues – sound and even throughout, including rump and thighs, bars black and fairly broad. Silvers – soft even shade throughout, flights and tail dun, bars as dark as possible: Powdered blues and silvers, frosted with white. Other colours as sound and clear as possible, except Chequers, which should be evenly chequered on the shoulders and rump as possible, and if on the thighs so much the better. Serious Faults: Lack of body size. Excessive trimming. Deficient in any of the standard properties. Order of Importance: It is vital importance that the highest standard should be obtained in a typical English Owl. Quality depends mainly on a general combination of the chief characteristics, head properties being of prime importance. Birds when exhibited should be in perfect natural condition.Benefical preparation of an exhibit should be encouraged. Re-formatted standard adopted by the English Owl Club on 30/01/12. Origin: Much the same as the Oriental Frill, Oriental sources. OVERALL IMPRESSION: The most important characteristics of this breed are the head properties, but all other attributes should be taken into consideration for the perfect specimen of the Oriental Turbit. Head: Large, massive, circular, having no peak, forming a bold and regular arch from front and side view, well filled in between eyes and beak and showing no flatness anywhere, as wide as possible, the width of the gape being the same as the width across the eyes. Eyes: Large, bold and set exactly in centre of the side of the head. Eye colour to be Claret or Bull. Eye Ceres: Fine, and neat in texture. Flesh colour. Beak: Short, thick, upper mandible well curved downwards, forming continuation of the curve of the skull. Lower mandible stout, meeting and fitting well into the upper. The top line of the under mandible must be straight and set so that if the line were continued backwards, it would run into the centre of the eye. The beak should be a flesh colour. Wattle: Fine in texture, small, neat and heart shaped. Neck: Short, rather thick, bodly tapering from the shoulders to the junction with the head, full under jowl. Neck Frill: Frill as ample and as well developed as possible. Breast: Chest and Breast broad, prominent and muscular. Body: Medium in size, compact and alert, rather short than otherwise. Wings: Flights short and carried compactly above the tail. Tail: Carried compactly and touching ground. Legs: Short and free from feathering below the hocks, brilliant red in colour. Plumage: Good feather quality, free from dirt and parasites. Recognized Colours: Black, Blue, Silver, Red, Yellow, Dun Chequer and Cream. Markings: Shoulders and wing covers, tail from line across rump coloured with respective colours. Colour to be deep and intense, all else should be white in colour. 10 x 10 flights and not less than 5 x 5. Order of Importance: It is vital importance that the highest standard should be obtained in typical Oriental Turbit. Quality depends mainly on a general combination of the chief characteristics, head properties being of prime importance, especially the beak setting, with good width and substance of the skull. Birds when exhibited should be in perfect natural condition. Benefical preparation of an exhibit should be encouraged. Ring size: UK “?? ?” ??? MM. Approved by the “Owl, Frill & Turbit Club” (UK) on ???? ?